Clyde boss Danny Lennon hailed his troops for heeding his call for them to be more consistent in their bid to scale the League Two summit. Saturday’s 4-1 victory over Elgin was the Bully Wee’s third in a row since a disappointing pair of defeats to Peterhead and Edinburgh City, the two sides ahead of the Broadwood men in the league table. And Lennon said it was a satisfying performance against the Moray outfit, who had gone into the game just outside the play-off places. Lennon said: “It was a fantastic result because they are a very good side coming off a great result on the road at Berwick last week. “I was absolutely delighted with the chances we created today and the overall level of performance. “One of the things we mentioned in the team talk was consistency because in terms of an old school report card, the start of the season has been decent but could have been better. 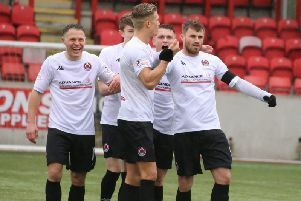 Gaffer Lennon also praised his side’s quality from set pieces, after centre-back Martin McNiff scored twice in the opening half from dangerous Clyde corners. Lennon added: “I’ve got to give a lot of credit to both the players and the staff because set pieces are something we work on very hard. McNiff – who is already up to six goals for the campaign – paid tribute to his team mates in helping his recent goal scoring purple patch. He said: “I was making the runs into the box last year, but nothing seemed to be coming for me. “It just seems now that any run I make, the ball is there to attack and that’s down to the delivery because if the ball isn’t there, then it doesn’t matter. The Bully Wee will aim to make it four wins in a row at Berwick next Saturday.